Cutting with scissors is fun for many children. When a child starts to show an interest in learning to cut with scissors, it is possible that they have already started the developmental progression of skills needed for scissor use. 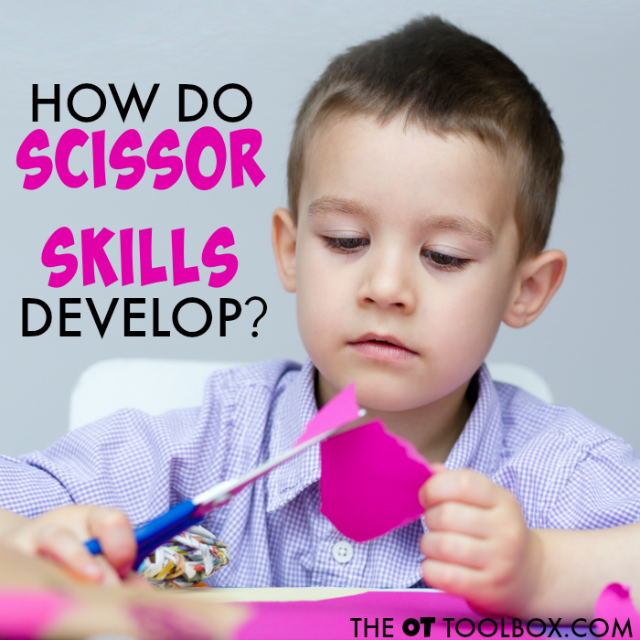 The steps of scissor skills development typically happens through play. So how do you know how a child learns to cut with scissors? And you may be wondering just how to teach a child scissor skills. In this post, I'm sharing the progression of development that allows a child to understand what scissors are to allowing them to use scissors accurately in order to cut complicated shapes. They might see older siblings or a parent using scissors on a regular basis and be familiar with how the scissors fits on their hand (although they may position them incorrectly at first). Or they might only know that that shiny tool can cut paper into two! Because these skills develop both individually and in coordination with one another, and because the progression of scissor skill accuracy greatly depends on practice, I am not going to include typical age-ranges in this particular scissor skill post. What you will see below is the general progression of scissor use. This development is important because we can see where accuracy and skill may breakdown with scissor use, safety, positioning, and accuracy when the underlying developmental stages are skipped or not successful. Another huge impact relating to successful scissor use is practice time. Kids that head into kindergarten without ever having held or used a pair of scissors will struggle more greatly with the cut and paste learning activities that happen in the typical kindergarten classroom. So, when it comes to helping kids learn to successfully use scissors, the greatest tip may be more practice! Here is one way to practice: Use recycled paper to practice scissor skills with this scissor skills crash course. Of course, when there are underlying areas that hinder successful scissor use such as fine motor control, visual motor integration, cognitive impairments, or other areas, then adaptations and accommodations to scissor tasks should be made. But how can we know if kids are on the right track when cutting with scissors? The steps of development below are one way to put together the big pieces of the scissor use puzzle! 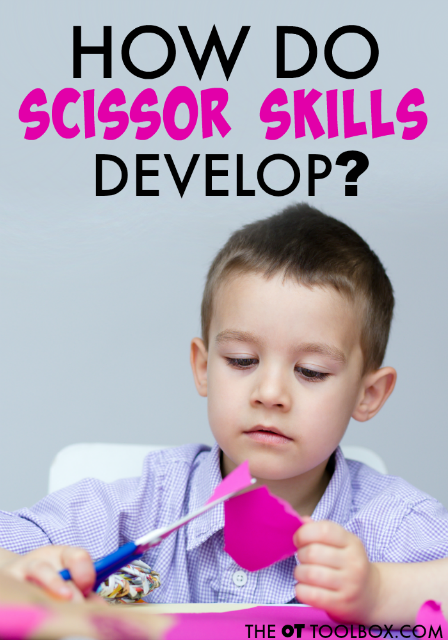 Use this scented scissor skills activity to help kids learn graded scissor use in a fun way! 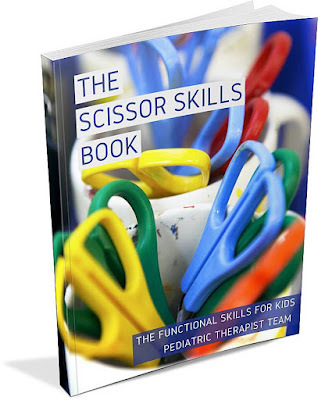 For MORE information on scissor skills, you will want to check out The Scissor Skills Book, an e-book by myself and other pediatric Occupational Therapists and Physical Therapists. It contains everything you need to know about scissor skill development, practice, modifications, underlying challenge areas, and more! Check out The Scissor Skills Book. Get your copy of The Scissor Skills Book!